It’s funny how some of the more delicious things that come out of your kitchen are the product of last minute improvisation. 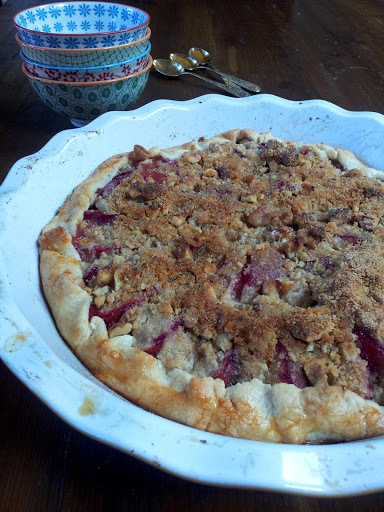 This Plum Pie Crumble as an example. It’s a pie and crumble in one!….Pieble? Just this Saturday I was going to attend a birthday party for my friend Diana. I wanted to bake something sweet and delicious. Knowing that Diana was a fan of the Apricot and Almond Tart I baked earlier, I decided to bake a similar tart with Italian plums. Ready, set, go! Except, last minute I discovered that I didn’t have cream cheese required for the filling. I suppose I could have gone to the grocery store, but instead, I turned to Ina Garten as inspiration and used her Plum Tart recipe as a base for this dessert. 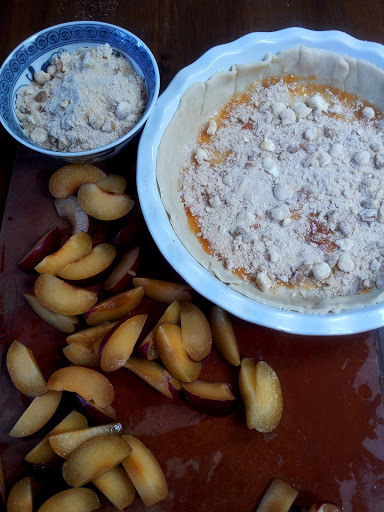 Rather than having the walnut crumble as the crust and the topping for the plums, I rolled out the pie crust on the bottom of the pie pan, spread it with apricot jam and then sprinkled it with some of the walnut crumble. The plums went on next, covered with the remaining walnut crumble. This was by far one of my favorite desserts, and I hope it will be yours as well. 2. Line the pie dish with the crust and spread apricot jam evenly over the crust. 3. Combine flour, walnuts and sugar in a bowl. Mix in butter and egg yolk until the texture resembles peas. Spread half a cup of the crumble mixture over the pie crust. This will soak up some of the juices from the plums as the pie crumble bakes. 4. Arrange plums around the pie plate, in a circle. 5. Sprinkle the rest of the walnut crumble over the plums. Fold the outside of the pie crust over the plums, to cover them slightly, by about 1/2 of an inch. Brush the edge with egg white. This adds a beautiful sheen to the baked dessert. 6. Bake the pie crumble in the oven for 40-45 minutes, until the crumble is golden brown. Half way through baking you might need to cover the dish with foil to prevent it from over browning. This is quite delicious both warm and at room temperature. I bet it would be tasty cold as well, but the Plum Pie Crumble disappeared too fast from the birthday table to have any leftovers. I invite you to make it at home to celebrate your friends’ or family birhtdays, or simply to celebrate Summer. Anna this looks delicious! I must get some plums and try this recipe out!